**PLEASE CAREFULLY READ** __Hong Kong and Macau only__ Only 03/15-03/31 Dear Hong Kong and Macau customers Due to Free shipping event to overseas, __all Free Shipping item __ will be __sent out as REGULAR MAIL__ (no tracking number, and might take forever to reach the destination. THIS IS YOUR OWN RISK). If you need tracking number please purchase shipping upgrade **Oversea** https://en.pinkoi.com/product/Ka43FTxd ------------------------------------------------ Handmade item Snake the luggage tie-up tag (aka luggage tag) Perfect for traveling luggage, suitcase, backpack or tote. Use for create an outstanding identity for your luggage while moving on carrousel belt. **IMPORTANT** Please note that there is no button on snake. You need to hand-tie in order to tie the snake with your belonging. For more information, please watch our how-to-use video on our instagram @beenbeanshop If you are not sure about the item on how it works, please contact me for more information. 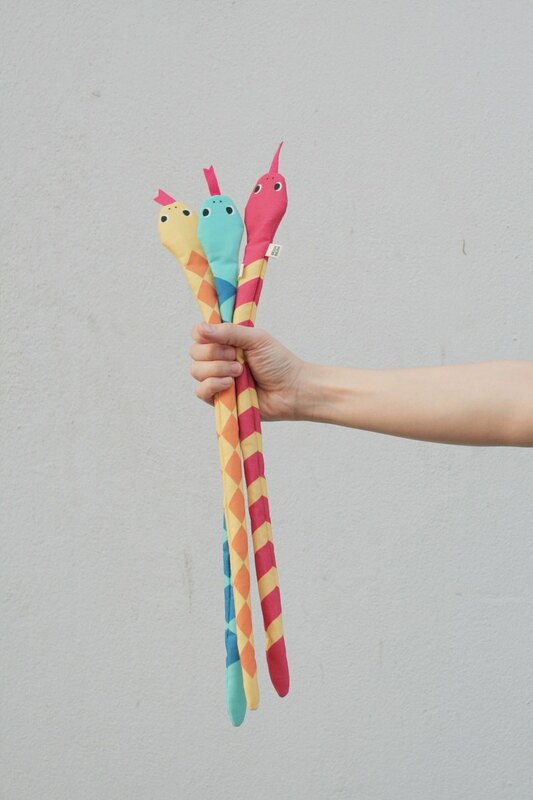 - - - - - - THIS LISTING contains 3 snakes - Red - Yellow - Green **colors cannot be changed or customized - - - - - - **DIMENSION** H 50cm x W 3cm Tongue length 3cm - - - - - - **MATERIALS** Snake is digital printed polyester canvas twill. Tongue is organic Japanese wool felt. (please do not pull) Every snake will go with small tag on neck. - - - - - - *This is handmade product, please be aware that each item might be slightly different. **Due to different screen resolutions, please note that colors may differ slightly. - - - - - - All item will ship as register mail with tracking number. For EMS, please contact me before placing an order.